A few posts ago I shared the “Peace Making and Peace Breaking” chart. When the kids were toddlers the examples centered around physical deeds – pushing, knocking down someone’s tower, throwing food, etc. We’re not out of the woods with that type of training yet, but as they get older their relationships revolve more and more around their words. Words are the backbone of every relationship. Think about God’s relationship with us. It comes through His Word. Our very access to Him is through the Word made flesh, His Son Jesus Christ. God places a high value on words. We should, too. Unfortunately words are one of the first ways our kids reveal their sinful hearts. “The things that proceed out of the mouth come from the heart (Matthew 15:18).” Our kids need us to put words in their mouths so they know how to talk appropriately. It’s kind of like the talking e-cards my mom is obsessed with sending me. Her favorite feature is making them say whatever she programs them to say. But, unlike those cards, our kids arrive to us pre-programmed. Their little mouths are already filled with phrases we would never put there, flowing out of their sinful hearts. We are working against the grain, teaching them what to say while teaching them what not to say. Often we stop after step 1. “Stop whining!” On a good day we get to step 2. “Stop whining! It’s ungrateful.” But the training is not complete unless we get all the way to step 3. That third crucial step models the beautiful two-part process of the gospel: our old sin nature is taken away and Christ’s righteousness is put in it’s place. 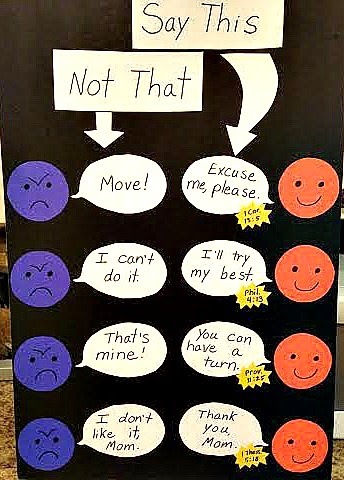 We don’t just tell our kids what not to say, but we model what to say. Out with the old, in with the new. Since kids are very visual, training that revolves around how to talk can be a tough concept. That’s why we decided to use a chart. 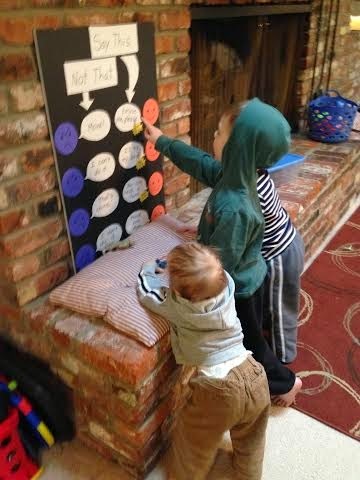 For the biggest impact, have your kids make a chart with you. Make it personal. Throughout the day jot down the most frequent negative phrases you hear. Then sit down with the kids and ask them for a loving alternative to each phrase. Find a scripture verse to go with each loving phrase and have your kids work on memorizing the verse with you. (“Excuse me, please) 1 Corinthians 13:5 – Love does not act unbecomingly. (“I’ll try my best.”) Philippians 4:13 – I can do all things through Christ who strengthens me. (“You can have a turn.”) Proverbs 11:25 – A generous person will prosper. (“Thank you, Mom.”) 1 Thessalonians 5:18 – In everything, give thanks. The chart, like our kids, is a work in progress. Leave room to add to it. Keep a bottle of white-out on hand to change it up as you notice new habits forming. CHALLENGE: Let’s take things a step further. What words would you like to replace when talking to your kids? Maybe you don’t need an actual chart for yourself (visitors might think you are a little crazy). But I find it very helpful to identify negative phrases I say regularly so I can have something ready to replace them with. Instead of, “I only have two hands!” I try to remember to say, “You can show Mommy love by being patient. I would love to help you as soon as I’m finished.” Using a kind word helps diffuse the stress I feel on the inside. Yes, the heart directs the mouth. But with practice we can use our mouths to help direct our hearts. This is something we have been unsuccessfully working on. Thank you for sharing your method here. I knew something was missing, but hadn't taken the time to think it through. Will definitely be giving this a try! Jaime, keep us posted! It's always a work in process. Love it. We'll be making our chart tomorrow. And thank you for directing us to the Word. Shawnelle, I would love to hear how it goes and what phrases you chose! I am always looking to good ones to add to mine. God bless!